Soil is a word which has a different meaning a natural body comprised of solids (organic and minerals matters), gasses, and liquid that occurs on the land surface, occupies space, and is characterized by layers, or horizons, that are distinguishable from the initial material as a result of additions, losses, transfers, and transformations of energy and matter or the ability to support rooted plants in a natural environment. The farmer and gardener think of the soil as the top few centimeters – the depth of plough or cultivation for the former and a spade or garden fork depth of the latter (the ‘topsoil’). They tend to ignore what’s underneath. Yet this deeper material (or ‘subsoil’) is very important for plant growth, storing and supplying nutrients and water. Also, a number of chemical substances (whether naturally produced within the soil or added by human activity) pass from the topsoil through to the subsoil. These may eventually reach underground water stores and rivers, burns or lochs. The soil consists of horizons near the Earth’s surface that, in contrast to the underlying parent material, have been altered by the interactions of climate, relief, and living organisms over time. Soil is a o home to number of different organisms, bacterias which help to provide nutrients to the plant. In fact, scientists believe that there are probably more individual species living below ground than above the surface e.g. Worms, beetles, caterpillars, ants and larger soil creatures. However, just one teaspoon of soil will also contain up to several million protozoa (probably the simplest form of animal life), bacteria, algae and nematodes (microscopic worm-like animals). Many of these species are vital to the proper functioning of soils. Unfortunately we know nowhere near enough about them to describe the roles of more than just a few. So a a grower we need to be more cautious about the soil health and should take proper steps to maintain the health of soil. Soil reaction or soil pH is an indication of the acidity or alkalinity of soil and is measured in pH units. Soil pH is defined as the negative logarithm of the hydrogen ion concentration. The pH scale goes from 0 to 14 with pH 7 as the neutral point. As the amount of hydrogen ions in the soil increases the soil pH decreases thus becoming more acidic. 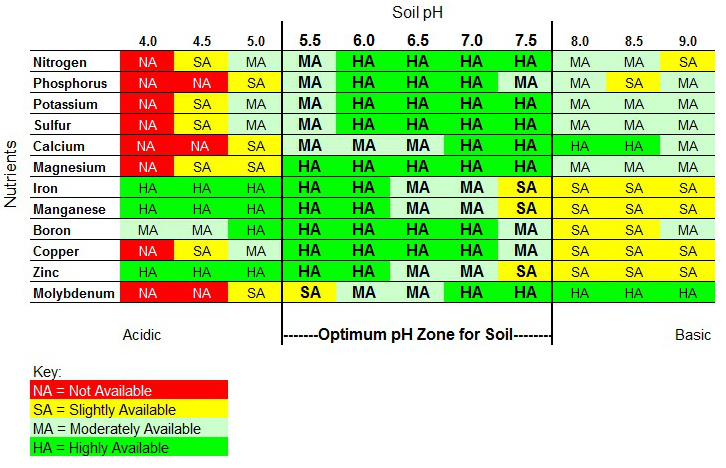 From pH 7 to 0 the soil is increasingly more acidic and from pH 7 to 14 the soil is increasingly more alkaline or basic. Formation of strong organic and inorganic acids, such as nitric and sulfuric acid, from decaying organic matter and oxidation of ammonium and sulfur fertilizers. Strongly acid soils are usually the result of the action of these strong organic and inorganic acids. Miscellaneous sources such as wood ashes. The amount of lime to apply to correct a soil acidity problem is affected by a number of factors, including soil pH, texture (amount of sand, silt and clay), structure, and amount of organic matter. In addition to soil variables the crops or plants to be grown influence the amount of lime needed. In addition to monitoring soil pH the nutrient status of the soil test should be conducted regularly for proper status of soil pH.